There are many risk classification options that companies can choose from. The best option depends on several things including the nature, complexity and size of the business. ISO 31000 provides answers to this problem but does not suggest any precise risk classification method. It emphasizes that every organization should develop its own system keeping in mind its needs and other relevant factors. Since every business is different, it faces different types of risks. This is why it is important that companies perform a business risk assessment as a part of business risk management to understand the risks it faces. Risk management is a very important part of an organization’s strategic management. It is the process in which companies address the risks that are associated with running the business. Every business faces risks that generally lie in the future and have some kind of probability attached with them. Not every risk is equally dangerous. Companies should properly understand every risk and see the damage it may cause to the business just in case it happens. Additionally, businesses should also make a list of the risks keeping in mind the chances of their occurrence or nonoccurrence. Once organizations are clear about this perspective they can prepare risk responses. 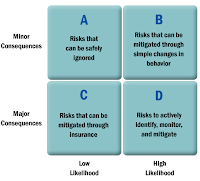 Risk management is important due to the danger risks pose. Since risks cannot be completely eradicated, risk management becomes a continuous process and an integral part of running a business. For better control, risk management should be integrated into the organization’s culture. This should include leadership, commitment and mandate from those in charge. Risk management plans should be enforced properly with responsibilities divided among those that are capable enough to handle everything. Additionally, there should be standards set to measure performance. It should also be remembered that the danger and probability associated with a risk factor may change with time, which is why the plan should be flexible and the company should keep an eye on the changing scenario. In addition to this, one change may result in another change of other risk factors. Companies should keep a close eye on everything and take calculated decisions. First risks have to be identified. Some risks are similar to every business while some differ from business to business. A strong risk analysis system is the right approach to identify risks. Once identified risks have to be evaluated to know where they arise from and what dangers they possess. A strategy should be planned to control and minimize the risks evaluated. Companies have four options: to tolerate, terminate, transfer or treat risks. The decision on which route to go should be taken carefully. Risks have to be controlled by implementing the strategy. Performance should be measured to see the impact. 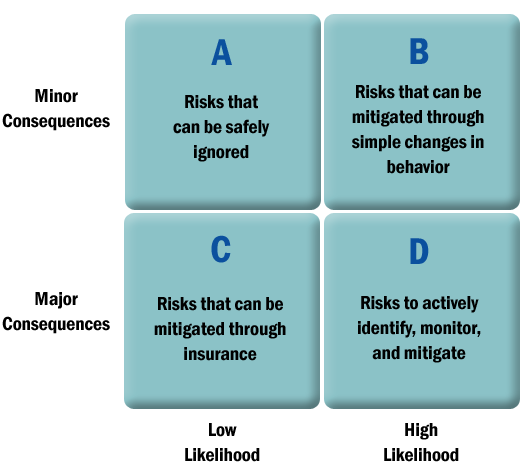 Since risks keep changing it is important to review the risk management framework and keep an eye on everything. How do people use social media in India? How to monitor Talent Management improvement?